The divine light of Zalhoon reaches even into the Wound - or so the church would have you believe. In truth, the torn lands are a haven of sin and apostasy, a fallen realm into which Sehmira must walk in her search for a secret rune of inestimable power. Thin, lean and sun-tanned, years of hunching over a reading desk in the Library-Spires of Kin Alaheen have left Sehmira with a distinct squint and slightly stooped shoulders. Her deft fingers are stained with ink and calloused from using a chisel and augur to inscribe stone and wood. 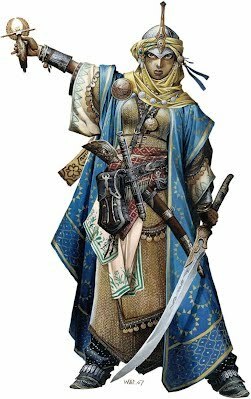 To protect herself on her journey amongst the heathens, she wears robes of dun and blue multi-layered silk, reinforced with leather and thin metal plates, and a steel skullcap under a golden scarf-shawl. Sehmira is a more scholar than preacher, more devoted to the mystical secrets of Zalhoon than spreading the faith. She is deeply learned in arcane lore, rune-craft, and has studied structures and ciphers. Serene and haughty, she holds herself aloof from the unenlightened folk of the Wound, seeing the enemy of her faith more in the wizards of Peria than in the masses. Sehmira was an oblate, a child given to the church as a form of human tithe. She grew up as a temple servant and altar girl, immersing herself in the holy books whenever she was not sweeping or polishing the bronze fixtures. The senior mystics noticed her intellect and focus, and began inducting her into the sacred rites of Zalhoon. She progressed well, seeking the meaning behind the secrets, the glyphs that made up the divine incantations, and was sent to the Library-Spires of Kin Alaheen to study magical theory and history. In her readings, Sehmira uncovered something called the Glyph of Disjunction - a rune that could literally unmake magic. Bringing her findings to the high scholasticists, they reasoned that the Glyph would be the ultimate weapon against the Perian magocracy, and a potent defence against the Invaders. It was determined that it was Zalhoon's will for them to find and recover the rune. Most of the inhabitants of the Library-Spires were well past their prime, however, and as the youngest and most energetic member, Sehmira was chosen as their emissary to this end. Praying to her god for guidance and strength, the rune-scholar girded herself for strife and prepared to make a pilgrimage north, into the Wound, where her readings indicated the Glyph of Disjunction could be found. None, as yet. Sehmira plans to carefully feel out the scholars and magicians of the Wound, to discover if any of them have information on powerful rune magic, and ally with scavengers to help her search.